On my way up to the ski area for Anthony's first ski experience, I stopped by the Shirohige Shrine on the shores of Lake Biwa (Japan's largest lake, about a third larger than Lake Tahoe). It was somewhat dark with a cloud mostly in front of the sun, with nice streamers of light emanating from the edge of the cloud, but overexposing the frame gives this interesting result. I have no idea why the shrine is named Shirohige, which means “white beard”. Okay, I looked it up... the name is meant to imply longevity, at least according to its Wikipedia entry, which also notes that it's the oldest shrine in Shiga (one of the prefectures that neighbors Kyoto). It's the head of the 292 shirohige shrines in Japan. I'd not heard of this shrine, except that we passed it last year on the way to an out-of-the-way cafe with tasty pizza. Remembering it when I took the same route this last Sunday, I stopped by for some pictures. I know of one other shrine gate in the water, the much larger, much more famous gate of the Itsukushima Shrine on Miyajima, not far from Hiroshima. This helped for my 6th grade report on Heian Jidai. Since Kyoto is where Heian-kyo is. 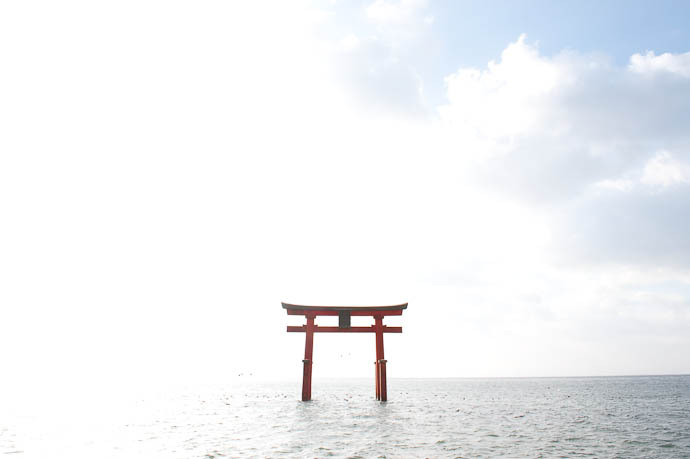 There’s a torii on Lake Ashi, Hakone — it’s quite close to shore. Here’s a picture (not mine).